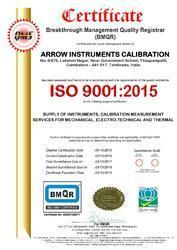 Arrow Instruments Calibration established in 2002 has emerged as a well-established service provider, exporter, importer and trader of Calibration Services. Our services include Temperature Calibration, Lab Calibration Services and Pressure and Vacuum Calibration. Our offered services are designed with innovation and technology thus escalating our client’s business operations. Under the brand name Atonic, our services are widely used in various industrial applications. 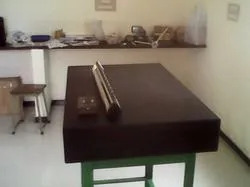 The calibration is performed in the environmentally conditioned room and our onsite our calibration services will not affect the production unit in any way. Our forte is to provide customized solutions using the most up to date technologies. Our range of services complies with distinct international quality standards. Furthermore, our customer centric approach, ethical business policies, and competitive prices have garnered our huge client base. We deal in Atonic brand. We have with us well-established infrastructure facility that comprises of latest designing mediums as well as advanced instrument support. 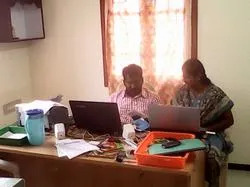 A fine culmination of facilities as well as sophisticated technology support, we together as a team ensure in successfully meeting calibration related demands of varied industries. Our team members are technology specialists and strengthened with the industrial know-how that assists us to deliver latest calibration services with the assurance of high performance. Our company adheres to its policy of providing our clients with impeccable services adhering to their requirements. Moreover, our services are checked by our quality experts who conduct strict quality checks at each and every activity of the company so as to ensure a quality oriented product range. Being extremely cost effective in nature and highly skilled our company has gained huge credibility among our industrial competitors. Driven by potent excellence and guidance of our mentor, Mr. Masilan A, we are able in attaining an unrivaled position in the market with our impeccable and services. His mission is to constantly maintain and consistently attain our commitments by providing complete client satisfaction, a continual focus on cost effective solutions. Arrow Instruments Calibration'' service will be provided at illuminated and noise-free environment. We provide excellent calibration services by deputing our well-trained and qualified calibration team with Master Equipments at your site. The calibration is performed in the environmentally conditioned room. Arrow Instruments calibration is prominent in site calibration by our calibration unit with our equipments and instruments whose accuracy will be carefully maintained by us. While we calibrate your instruments at site, our calibration services will not affect the production unit in any way. Our organization holds expertise in offering tailor made Calibration Services to our valued clients. We have gained success in this domain, which is entirely due to the expertise, commitment and original ideas of our team members. Furthermore, we have a separate team of logistic personnel who apply maximum efforts to offer the best solution to our clients. By offering reliable solutions to our clients, we have carved a niche for ourselves in this competitive industry. We provide excellent calibration services by deputing our well-trained and qualified calibration team with Master Equipments. The calibration is performed in the environmentally conditioned Room. Arrow Instruments calibration is prominent in site calibration by our calibration unit with our equipments and instruments whose accuracy will be carefully maintained by us. While we calibrate your instruments at site, our calibration services will not affect the production unit in any way. Feature of site calibration are save your time, avoid instrument''s damage, non stop your production, good relationship between both sides. Certificates will be provided after calibration without any delay. Payment at 100% of against Calibration. For site calibration, To & Fro Lodging and Boarding charges are extra at actual. Calibration marking stickers will be pasted on every instrument. Delivery 8 Hour from the Received time.